A tale of serendipity and hard work. Now we are 10 years on, in the village of Moskosel deep in Swedish Lapland, not far from the mosquito camp. One evening Bengt is standing on a chair, changing a light bulb in the church hall, and it was not just the lamp that lit up... "I'm going to start a business making Nordic tipis! ", he thinks. Over the years, Bengt's desire to make the best possible tent combined with his knowledge of the Sami kåta (the traditional home of the Sami people, indigenous to the area) became fused in that moment of decision. And so it began. 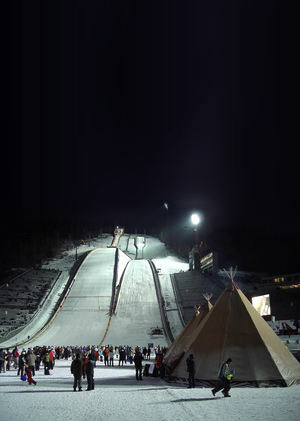 Moskoselkåtan AB (since renamed Tentipi AB) was incorporated and Bengt was on his way. Armed with a set of cutting plans for a cone-shaped tent purchased from a local businessman (which turned out to be all but useless), and a huge dose of self-confidence, Bengt began teaching himself to sew, turning enormous pieces of cloth into large Nordic tipis. At first, he did everything himself, from purchasing and sewing to marketing and selling. However, it did not take long before he employed his first worker. 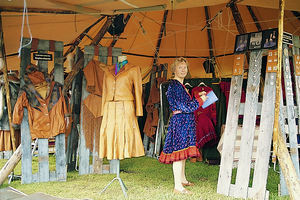 The tent production proved to be profitable and new products began to be developed. The first request for a truly giant Nordic tipi arrived, and Bengt made a deal to sew the canvas, with the poles being provided by someone else. Arriving on site to install the new tent (the day before it was needed) he was dismayed to see the trailer full of poles being driven on to site — they were anything other than straight; it would be quite impossible to use them. But the show must go on so, chainsaw in hand, Bengt went out into the woods to find tall, straight trees that would be suitable. He worked through the night, and by 5am, had cut and trimmed sufficient poles to build the frame. The canvas was fitted (it fitted perfectly), and the show did go on. 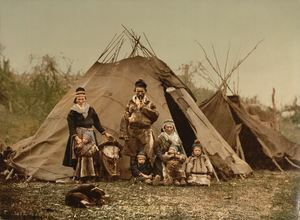 Like so many early versions of new products, those early giant Nordic tipis had their problems. The poles were long and straight — yes — but they were heavy and brittle and snapped too easily if dropped or exposed to heavy wind. The tipis took a long time to build — 2 people for 8 hours. And the fitting of the canvas required some final bits of sewing on site, which meant Bengt had to be there to install every tent. A chance meeting with a woodsman opened up the possibility of using a different type of timber that only grows in a narrow band of latitudes in the northern Scandinavian forests. It grew straight, was light, flexible and immensely strong. Experiments showed that it was perfect for the job, the strength and flexibility coming from the extremely slow annual growth rate (Stratus main poles are typically 100 years old when felled). The right trees are not so easy to find, though — individual trees have to be selected and felled by hand — a task undertaken in the Swedish winter by self-employed foresters. They head out into the forests, select, cut and trim the timber and drag it back to base behind their snowmobiles. Build times were reduced and on-site sewing dispensed with following a radical redesign of the method for building the timber framework, and for getting the canvas on. So much of the redesign was brand new thinking that several patents and design rights were applied for, and granted. The next big step forwards came in 1993. 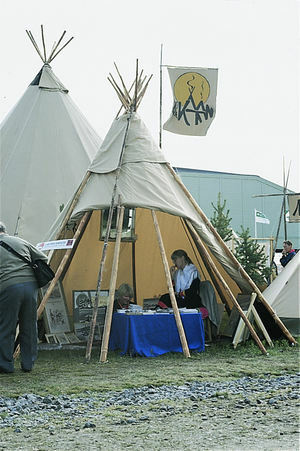 A Sami cultural organisation, impressed by the tents they had seen around, approached Bengt and asked him to create a 25 m x 50 m exhibition space to promote Sami products and Sami culture. That was a huge project to take on at the time, and it occurred to Bengt that he needed a Nordic tipi where the sides could be opened, so visitors could see the displays inside as they walked past. He had experimented the previous year in Stockholm with rolling up the sides of the tipi to achieve the same effect, but that meant losing an area of covered space, reducing the effective size of the tent. How else to solve the problem...? The idea to introduce expansion wedges into the lower half of the canvas came in another moment of inspiration; a practical idea to solve a specific problem but with huge positive implications as we will see later. 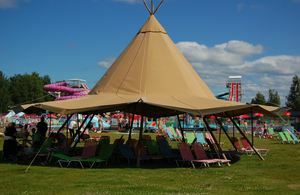 If the wedges were tightened, the tent could be pitched like a standard tipi but, if they were loosened, the bottom half of the canvas could be raised up and supported on wooden poles to create a giant witch's hat shape. Opening the sides like that created more covered space under the tent, not less, and gave passing visitors an uninterrupted view of the inside of the tent. The first "Giant Hat" Nordic tipi (since renamed Stratus) was duly made and used for the event... and it went down a storm. Copyright protection for the shape of the Stratus as a work for applied art was applied for and granted, although only for a limited period — it expires 75 years after Bengt's death! For the next leap forwards, we must look outside of Tentipi to an enterprising Sami businessman named Roger Rimpi. Roger had been exhibiting on the Sami exhibition stand and was especially impressed with the Stratus. He was the first to see the possibility of using the way the sides raised up to link the tents together to make a single larger structure. Later in 1993, he linked the first three Stratus together for an event at Stockholm zoo. The Stratus had not been explicitly designed for linking, so those early links took some figuring out. But as more and more people began linking the tents, new products were introduced to support the linking, the Stratus itself was modified, and the linking techniques were improved, becoming more reliable and easier to teach. This ability to link is what really sets the Stratus apart. It is possible to create all sorts of weird and wonderful shapes, and to make really large covered spaces. The record to date is 34 Stratus linked together to host a dinner for 2000 people. Word spread about the Stratus and its ability to link to form larger structures, and tents were sold into more and more countries, and used for an ever-expanding range of events. Anything from an English Country Wedding to a Norwegian Ski Jumping Competition, from an Australian Beach Party to a German Music Festival, and many other uses in between. With that increasing usage came increasing demands which needed to be met: new features for certain markets; different fire retardancy standards; the need for formal structural calculations. Keeps the rain out when it is deliberately stretched tight against rustic wooden poles. Isn't too heavy, so the tent can be built by hand, without using machines. 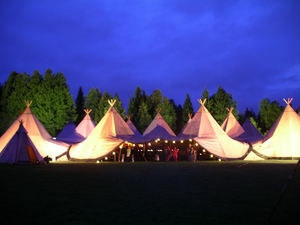 Is strong enough to cope with the stresses and strains that occur in a tent of this size. Meets the fire standards in a number of different countries. Does not shrink too much, or stretch too much. Feels and looks right — PVC would not work (most large tents are made from PVC these days) because it would destroy the aesthetic beauty of the tents. Has a low environmentally impact. Over the years, the globe has been searched for fabrics that meet the requirements. Hundreds of fabrics have been looked at, and many dozens tested before realisation dawned... there is no standard fabric that does the job. So it has been necessary to partner with a textile manufacturing company to develop a bespoke fabric that does. There's no doubt this will be an ongoing process as new standards emerge, and new countries begin to use Stratus. So we arrive at today, with a product packed full of features developed as the result of nearly 20 years experience of real world use, on real sites, and in real weather conditions. The journey doesn't stop here, though. There is an active, ongoing product development programme with 3 aims: 1) to introduce new products to use alongside the Stratus, extending its relevance to a wider and wider range of events; 2) to invent new ways to build, dismantle and link the Stratus more quickly without compromising safety; 3) to keep ahead of developments in standards relating to fire retardancy, structural stability and environmental impact.